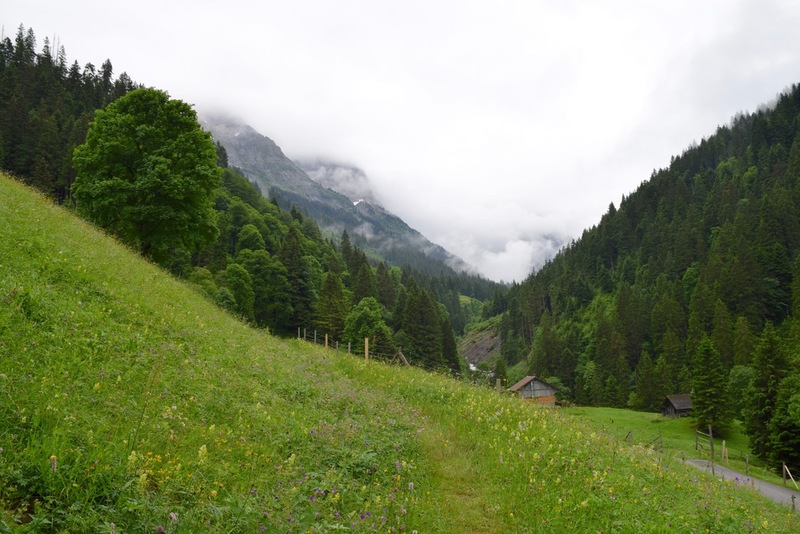 I had read a little about the Via Alpina green trail, the hiking route that crosses the width of Switzerland, but it took me some time to realise that my new Traumhaus in Meiringen was right on top of it. 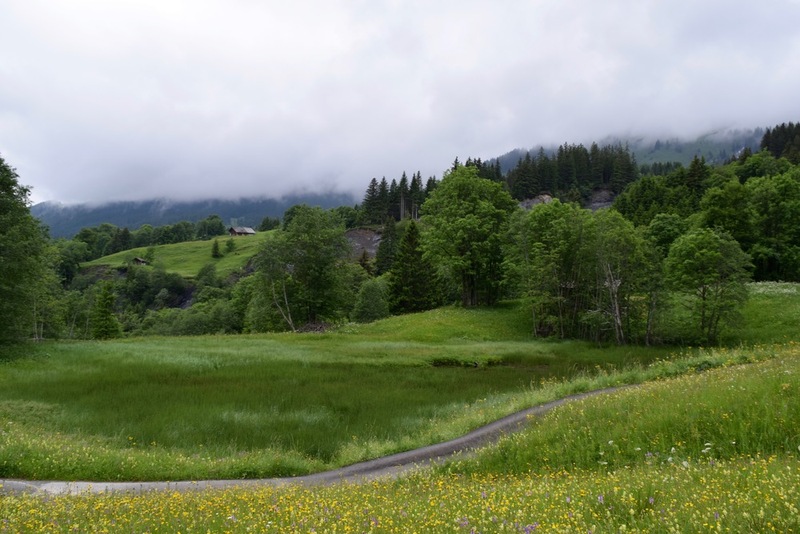 I set off at 9 o'clock in the morning, heading towards Meiringen train station before following the Via Alpina sign markings that take you towards the Reichenbach Falls. This, fellow bookworms will note, is the scene where Sherlock Holmes fought Moriarty and fell to his supposed death in Sir Arthur Conan Doyle's stories. I can see the waterfall from my dining room window and usually end up looking its way at night, when it's illuminated. Meiringen thrives on its legacy, with "Conan Doyle Place" and "Sherlock Club" being just two of the magnets for Holmesians in the towns. As I was wisely told during my apartment viewing, "Tourists in Meiringen are either climbers or fans of Sherlock Holmes". After passing the Reichenbach Falls and climbing a little higher, you reach Zwirgi and realise you're not in Meiringen anymore. I won't disguise that when I stopped to take this photo, about only one hour into the hike, I was feeling exhausted and unfit. My face was burning hot, I was sweaty, and my left shoe was starting to rub at the back where it was a little too big. I thought about turning back more than once, but knew that if I did, I'd have to do it all again. After all, I wanted to hike every stage of the Via Alpina. So off I went, voyaging further into the heights of Berner Oberland. It was a very misty day, but I didn't mind this. I'm too fair of complexion, too English, and too redheaded to thrive in hot weather. 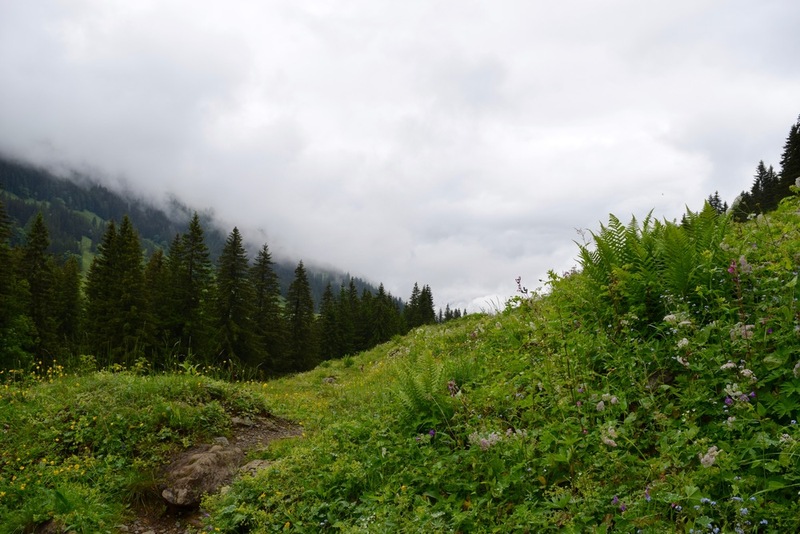 I found it a challenging hike, covering 23 km and climbing 1550 m, and I was ultimately glad for the cooler weather, even if the views weren't as spectacular as usual and my photos suffered for it. Whatever the weather, it's a wonderful hike. 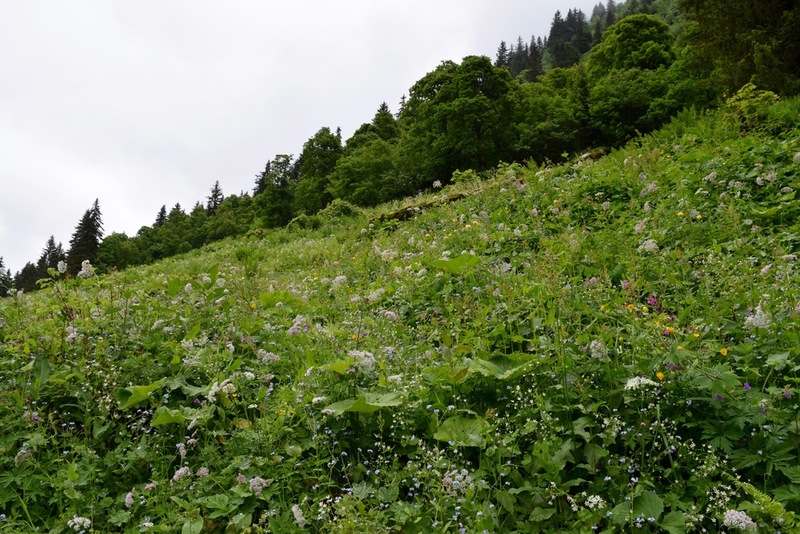 July brings all sorts of beautiful flowers to Switzerland, and I greatly enjoyed seeing a bed of colours and petals on either side of the footpath. 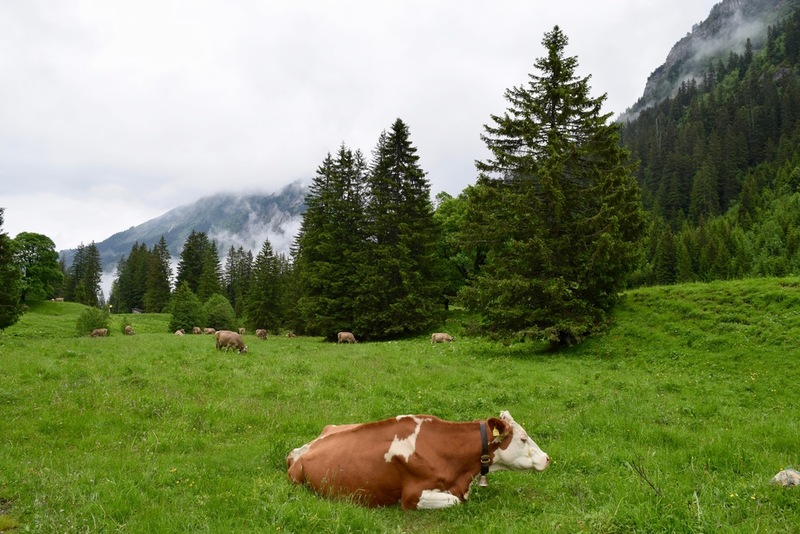 And, because it's Switzerland, there were cows patrolling the route. I sat for lunch in the woodland past Rosenlaui, feeling entirely and gloriously alone in nature. I was rather startled when four men on mountain bikes passed me, each one slowing up and saying a quick grüezi as they cycled past my tree-trunk-turned-bench. The third man alas, was more startled than I was. He looked up, greeted me, and then caught his tyre and flipped off his mountain bike. "Scheisse!" he shouted, as the forth man, now next to me, laughed and told me I must have had the best seat in the house for that. Indeed I did. 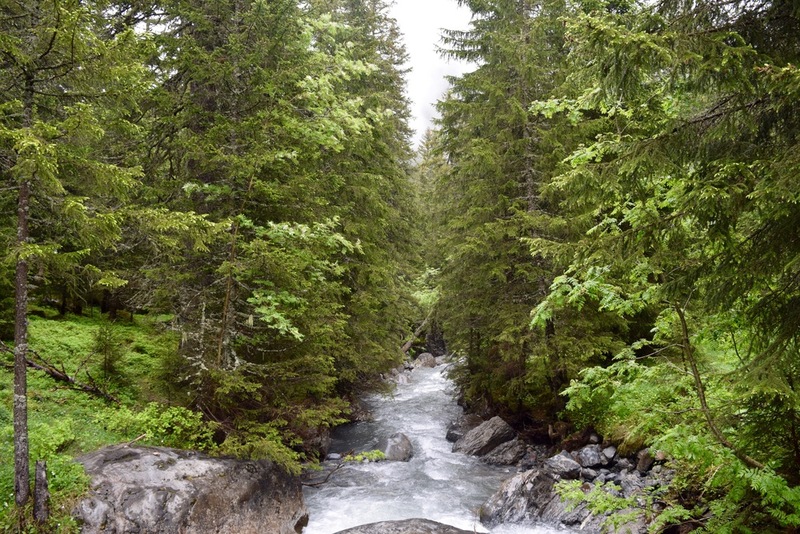 As I pressed on, I crossed glaciers, rivers, fields, and woodland. And about three hours after I set off, I reached the peak of Grosse Scheidegg. This felt like a great achievement for a Sunday lunchtime, and rightly so. I'd climbed a mountain! While I had enjoyed gaining altitude for the last few hours, knowing that the rest of the hike would be downhill was a luxurious feeling. The road down from Grosse Scheidegg towards Grindelwald has wide bends to suppress the altitude, but the footpath cuts through it in a straight line. My shorter and more direct route soon became a race against the Post Bus that was also making its way down to Grindelwald. The bus overtook me the first time on the winding road, and I stood in the grassy roadside to let it pass. I cut through the woods, joined the road again, and came out ahead of the bus that was still chugging along the road behind me. The bus driver, a woman walking her reddish-fleeced dog, and I spotted an obstacle up ahead: a herd of goats making use of the mountain road. The bus horn sounded a warning. This prompted no hurry from the goats, and another horn followed. Meanwhile I escaped through another woodland shortcut, the woman and dog behind me, but the bus was stuck, facing a delay that was no doubt already noted on the SBB mobile app. The goats must have eventually surrendered, for the bus rolled past minutes later. Some teenage boys waved at me from its right-hand side, and the bus soldiered on for Grindelwald. 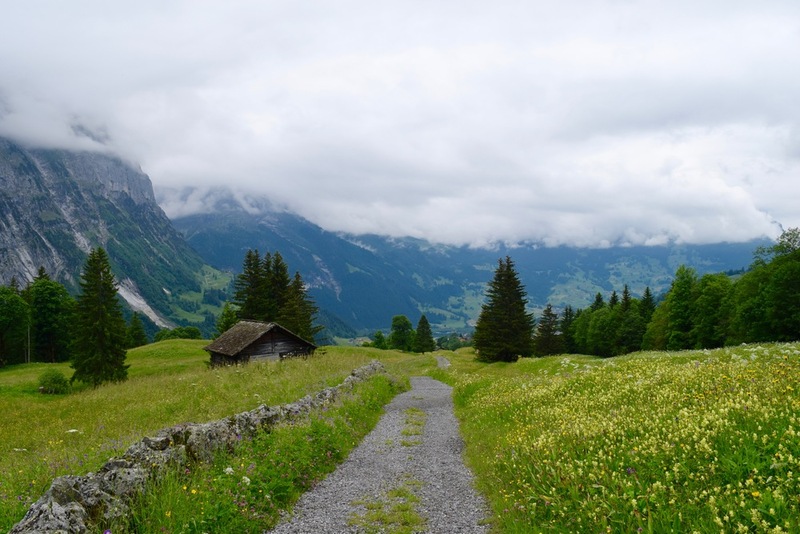 I arrived in Grindelwald about two hours later after walking through more flowery meadows, past wooden huts with no signs of life, and swiftly through a llama-guarded gate. The town was familiar turf for me. As I crossed Grindelwald, I walked past the restaurant where I had enjoyed Apfelstrudel and Mövenpick ice cream last September (despite a ceaseless assault from sugar-crazed wasps), and I stopped to lean over the railings to smile at the mini golf course that I need to conquer again this summer. As I bought my ticket at Grindelwald train station, I found myself thinking that CHF 11.00 was an extortionate price when one could simply walk from Grindelwald to Meiringen. On the train, I watched the scenery of the non-direct, non-mountain, and non-exhausting route pass by, and after an hour, I arrived home feeling like a happy and accomplished hiker.